Nunhead (All Saints) Cemetery contains 592 Commonwealth burials of the 1914-1918 war. 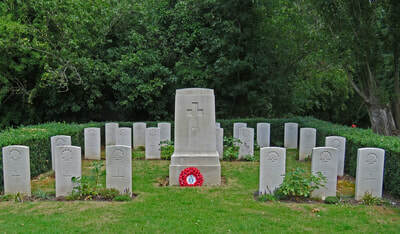 The majority are in three war graves plots; the United Kingdom plot (in Square 89) has 266 graves, the Australian plot (near the main entrance) has 23 and the Canadian plot (in Square 52, also containing New Zealand and South African burials) has 36. 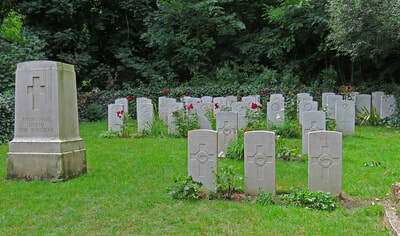 The graves in the Australian and Canadian plots are marked with individual headstones. The graves in the United Kingdom plot and the remaining war graves scattered throughout the cemetery could not be marked individually; the casualties buried in these graves are therefore commemorated by name on a Screen Wall inside the main entrance gate to the cemetery. A second Screen Wall commemorates the 110 burials of the 1939-1945 war in a further war graves plot in Square 5 and elsewhere in the cemetery whose graves could not be marked by headstones. There is also 1 Belgian burial of the 1914-1918 war and 7 Non-war Service burials, all commemorated on the Screen Wall.